WASHINGTON (Aug. 03, 2015) -- If Soldiers were still unsure of what bad behavior looks like online, the Army clarified it for them in an "All Army Activities" message -- commonly called an ALARACT -- that went out force-wide last week. Online misconduct, it says, is "the use of electronic communication to inflict harm. Examples include, but are not limited to: harassment, bullying, hazing, stalking, discrimination, retaliation, or any other types of misconduct that undermine dignity and respect." If Soldiers were still unsure of what bad behavior looks like online, the Army clarified it for them in an "All Army Activities" message -- commonly called an ALARACT -- that went out force-wide last week. Online misconduct, it says, is "the use of electronic communication to inflict harm. Examples include, but are not limited to: harassment, bullying, hazing, stalking, discrimination, retaliation, or any other types of misconduct that undermine dignity and respect." The ALARACT 122/2015, which comes as part of an effort to address Soldier use of social media and other online forms of communication, also defines good behavior online, "electronic communication," and "online-related incident." "The Army Values require that everyone be treated with dignity and respect," the message reads. "Harassment, bullying, hazing, stalking, discrimination, retaliation, and any other type of misconduct that undermines dignity and respect are not consistent with Army Values and negatively impact command climate and readiness." The ALARACT emphasizes commanders' responsibility to "reinforce a climate where current and future members of the Army team, including Soldiers, Army civilians, contractors, and Family members, understand that online misconduct is inconsistent with Army values." The document also said such a climate included an avenue through which "online-related incidents are prevented, reported, and addressed at the lowest possible level." In March, the Army's chief of staff directed the creation of a "tiger team" to address the issue of online misbehavior, including retribution, and to find ways to prevent and respond to harm inflicted through the use of electronic communication. One goal of the tiger team was to create a reporting system for "online-related incidents" and report those up to senior Army leadership. Tiger team member Lt. Col. Kay Emerson, who also serves as director of the Army's Equal Opportunity policy office, said members of the Army staff and command representatives are working now to identify the data fields and reporting requirements for such an online reporting system. "Once collated, senior Army leadership will have a sight picture of reported online-related incidents and actions taken by commanders in the field," Emerson said. The Army is expected to update AR 600-20 in the next published version to address online and social media violations. Emerson said she is currently re-rewriting paragraph 4-19 within AR 600-20 to incorporate the Department of Defense's drafted policy with the Army's online conduct efforts. Section 4-19 of AR 600-20, called "Treatment of persons," addresses hazing and bullying, as well as command and individual responsibilities in regards to them. Both the regulation and the ALARACT direct Soldiers and Army civilians who experience or witness online misconduct to report it to their chain of command. Additionally, section 4-19 of AR 600-20 is "punitive" in nature. It authorizes commanders to potentially punish those who are in violation of its direction, making failure to adhere to the Army's rules for online behavior a punishable offense. "Soldiers who violate this policy may be subject to punishment under the UCMJ [Uniform Code of Military Justice]," the regulation reads. "Whether or not certain acts specifically violate the provisions of this paragraph, they may be inappropriate or violate relevant civilian personnel guidance." Despite new rules and direction in regard to use of social media and other forms of electronic communication, the Army says it doesn't want to stop Solders from communicating online. 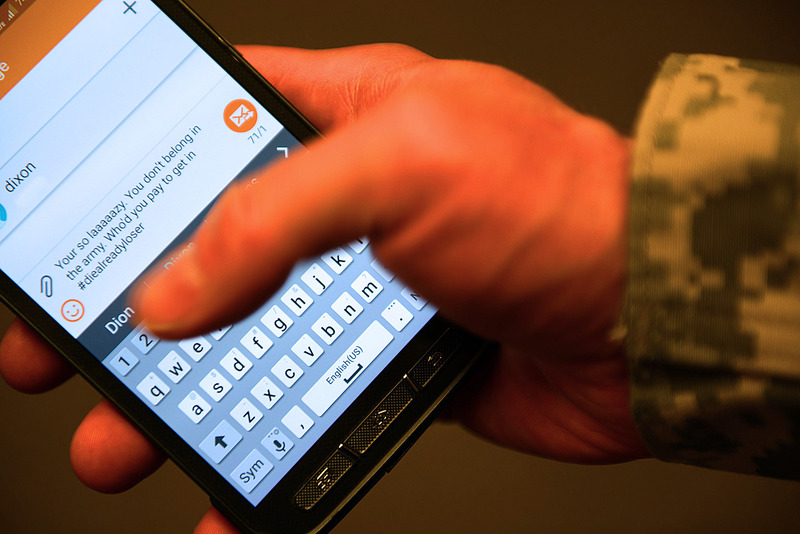 Instead, said an Army official, when using electronic communication devices, Soldiers should apply "Think, Type, Post." That maxim is summarized as "think about the message being communicated and who could potentially view it; type a communication that is consistent with Army values; and post only those messages that demonstrate dignity and respect for self and others."